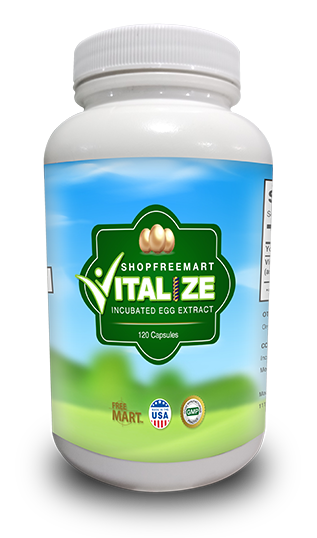 ShopFreeMart Vitalize™ is comprised of MeB12 in combination with nutrients that are extracted from 9-day-old, incubated, fertile chicken eggs using a patented process developed in Norway. No other dietary supplement on the market brings together these advanced ingredients in clinically relevant dosages to provide fast, long-lasting support for mind-body wellness under times of stress. ShopFreeMart Vitalize™ nutritional profile includes amino acids, glycopeptides and oligopeptides held in a unique balance not found in other whole food supplements. A number of clinical studies indicate that this extract acts as a catalyst for hormonal production and expression, including testosterone, the hormone with the most potent effect on sexual desire for both men and women. Incubated Egg Extract has shown to provide major benefits for people dealing with stress-related conditions, due to its ability to positively influence levels of cortisol, often called “the stress hormone. And of course, no stress support supplement would be complete without the key “anti-stress” Vitamin B12. But we didn’t settle for just any B12. We selected only the most clinically advanced, high-absorption, pharmaceutical-grade form possible. MeB12 is a patented form of methylcobalamin costing over $3,000 per pound. *No other dietary supplement on the market brings together these advanced ingredients in clinically relevant dosages to provide fast, long-lasting support for mind-body wellness under times of stress. The study used nonsmoking healthy male volunteers, age 20-50 years old. 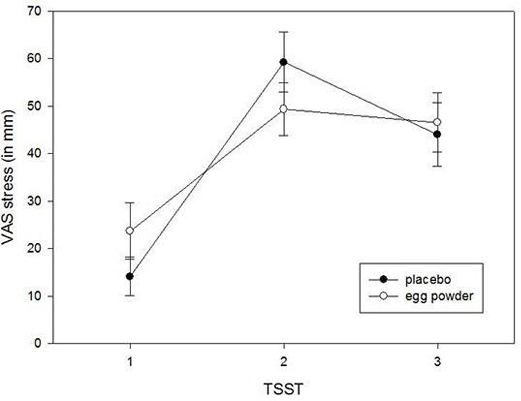 The result of the study showed that the participants taking Patented Incubated Egg Extract scored significantly lower in the subjective acute stress under TSST compared to the placebo group (graph below to the left). 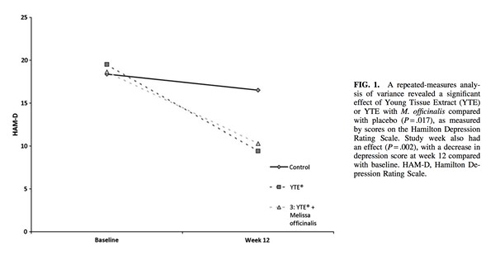 Also, Published in the Journal of Medicinal Food, a 12 week double-blind, placebo-controlled study investigated the effects of Incubated Egg Extract intake on outcome measures for depression. 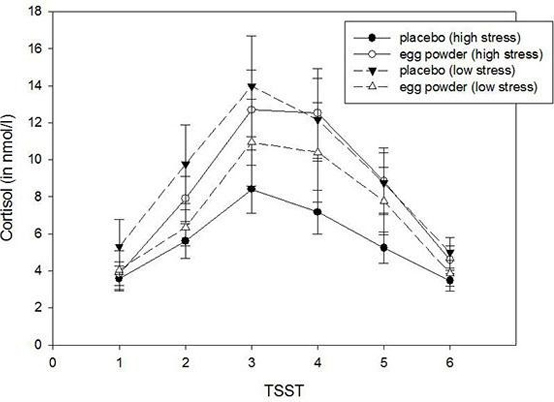 The study indicates that the fertilized egg powder has an anti-depressive effect and may be an alternative or an adjunct to anti depressive medication for some patients. A six-week, double-blind placebo-controlled study was conducted by Professor Törnblom at the University of Colorado and Arapahoe Community College. The study compared the effectiveness of two nutritional supplements in increasing muscle strength and muscle mass. The effects of taking 5 grams of a 50/50 blend of Incubated Egg Extract and Creatine were compared with taking only 5 grams of Creatine Monohydrate by itself. Results are shown below. In 1997 a study was published to The Journal of International Medical Research through Cambridge Medical Publications that looked at how Incubated Egg Extract could increase male libido. Boiling the eggs compromises some of the health benefits, but both of these eggs are said to give you strong knees, good libido and a very refreshing night’s sleep and that is due to the high content of proteins and a substance called Laminin. Laminins are literally what hold us together. They are Cell Adhesion Molecules and without them, we would literally fall apart. Laminin content reaches its peak at 9-days of incubation and many people have claimed to receive almost miraculous health benefits after consuming these eggs for a period of time. These nutrients include proteins, 22 amino acids, vitamins, minerals, growth factors and biological defense factors, oligopeptides and glycopeptides among a host of other nutrients needed to develop the embryo and produce a healthy chick. Note: These are all-natural nutrients extracted directly from a universally accepted food source (fertilized chicken eggs) and are not to be confused or associated with synthetic peptides and other unnatural substances. A few years ago, the original patented Incubated Egg Extract from Norway was introduced to the world using a different trade name than Vitalize™ through referral-based marketing. A vast majority of people who supplemented with the original patented formula were amazed at their increased alertness, mental acuity, reduced joint pain, increased mobility, improved energy levels and feeling of well-being. FreeMart has acquired the “original” IEE™ Incubated Egg Extract and we are extremely excited to now be able to offer it to our FreeMart members! How does Vitalize™ Work as a Dietary Supplement? In the 1970’s a growth factor called FGF was discovered in 9-day-old Incubated Eggs. FGF is not present in other amino acid formulas. FGF must be acquired through the diet, so unless you make a regular habit of eating balut or penoy, you will no doubt see the importance of supplementing with FreeMart IEE Supplement. FGF is responsible for the complex process of turning amino acids and other nutrients contained in the chicken egg into the building blocks of life. Studies showed that Incubated Egg Extract can reduce cortisol production by nearly 50 percent. Cortisol is a leading cause of stress and stress related weight gain. Reducing cortisol is one of the keys to keeping chronic stress under control, achieving emotional balance and preventing the formation of fat cells caused by stress. Glycine is a neurotransmitter found in 9-day-old incubated eggs that enhances brain function and memory by controlling glutamate levels in the brain. Cysteine is another amino acid found in 9-day-old incubated eggs. Cysteine is a precursor to glutathione which is the body’s master antioxidant that protects the cells against free radical damage. L-cysteine found in 9-day-old incubated eggs is necessary for healthy skin, hair and nails. Continued use of this amino acid tends to beautify and enhance appearance and texture of skin, hair and nails. Amino acids are the building blocks of protein and protein is the building block of tissues. ShopFreeMart Vitalize™ is an excellent source of 22 amino acids. The peptides found in Incubated Egg Extract come from fertile chicken eggs (a universally accepted food source) and are not to be confused with peptides synthesized in a laboratory. ShopFreeMart is a membership club and you must be a member to purchase our products. There is never any obligation to purchase anything and membership is totally free.